Personal Instructor. Personal curriculum. You make the rules. Precision Learning’s private courses make the TOEFL® bend your way. Not to mention, we build your confidence, too. So, are you accepted yet? Which private package should I choose? That depends upon your goals. Some students are generally prepared for their exam, but feel the need to take a private course in order to fine tune some of their weaknesses. Or there may be certain imminent deadlines involved. These students may typically sign up for a shorter course. A typical Silver student – with two private sessions per week at two hours per session – would likely meet with an Instructor for up to five weeks. Others may prefer an intensive immersion experience that goes into even more critical depth on methods and strategies in practice for their exam, or they may just have more time to prepare. These students may typically sign up for a longer course. A typical Rhodium student – with two private sessions per week at two hours per session – would likely meet with an Instructor for up to five months, or more. Any private course, however, can be adjusted to meet your schedule. If you’re not certain of where you stand, sign up for a free session to speak with one of our counselors, or, just give us a call. *Private admissions counseling included with all private courses above Bronze. Which private package would you prefer? Free SessionIf you’re not quite ready. Includes a personalized TOEFL® analysis that aligns you with your goals, an assessment to gauge where you stand in your preparation, a valuable mini-class with insight into the best methods to prep for the exam, and free bonus materials. 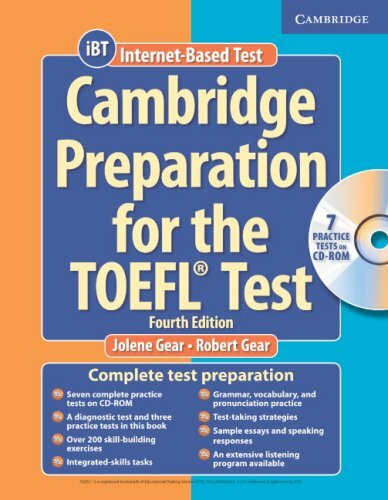 Test takers can prove they are ready for academic success with the TOEFL® test — the most widely accepted English-language assessment test in the world. The TOEFL® test is accepted by 7,300+ colleges and universities in 165 countries. Using the latest technology, the TOEFL® test is given in an Internet-based format (iBT) that fully integrates all four language skills measured: listening, reading, speaking and writing. A paper-based test (PBT) is given where Internet-based testing is not available. With unmatched scoring procedures and security measures, the TOEFL® test is the industry standard in English-language assessment. Precision Learning: a place where quality, affordability, and excellence are combined, and where the result is nothing short of revolutionary. Precision Learning’s intensive and dynamic TOEFL® courses, both group and private, enhance critical thinking, problem-solving, speed-reading, reading and listening comprehension, speaking and writing skills, and much more, while demystifying concepts that other TOEFL® programs leave behind – guaranteed. Precision’s 16-session Intensive Prep™ group courses and flexible Premier Private™ courses cover the key factors for true success on the TOEFL® – in-depth – containing rigorous training that help raise scores from several time-tested and proven vantage points. Precision’s TOEFL® courses work through an extensive array of TOEFL® preparation materials, including the newest edition of the Educational Testing Service’s Official Guide to the TOEFL® Test. 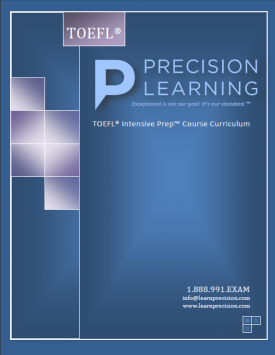 Precision’s course and coursebooks offer prospective college students intensive preparation for the TOEFL®, providing perspectives on the exam with a TOEFL® overview, advice on effective test-taking tactics, and a diagnostic test to help students pinpoint their strengths and weaknesses. The course intensively reviews all TOEFL® test areas, with practice exercises for each of the four sections of the TOEFL® – or particular sections for private courses. The course includes several full-length TOEFL® exams that reflect the actual TOEFL® in length, question types, and degree of difficulty. All exams are then scored and explained in order to assess progress throughout the course. Precision’s TOEFL® courses also develop speed-reading, time control on the TOEFL®, and other critical points for strategic success. Precision Learning students gain valuable experience, and dynamically raise their levels of confidence by learning critical concepts, methods, and test-taking approaches, by taking checkpoint practice tests, and by completing focused sets of practice questions just like those on the actual TOEFL®, all with the guidance of a superbly qualified Precision Learning TOEFL® Instructor. Tuition is all-inclusive and comprises of course registration, tuition, official examinations, coursebooks and other materials, CD-ROM, on-site parking, and post-course admissions counseling. Get the score you deserve – and get accepted with Precision Learning! In addition to our Premier Private™ TOEFL® instruction, Precision Learning offers on-site-based live instruction, with small, exclusive TOEFL® classes at both of our New Jersey locations. 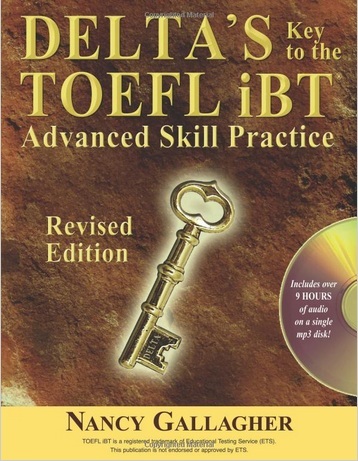 This 16-session course covers the key factors for true success on the TOEFL® – in-depth. Installment Plan Offered: $182 initial deposit. Two additional installments of $182. Save $49 by paying in full! Imagine. A Precision Learning TOEFL® course tailored precisely to your needs, that comes along with your dedicated TOEFL® Instructor, who will guide you to the achievement of your individual goals. It’s like having a personal coach walk you step-by-step through your TOEFL® journey. As a Precision Learning Premier Private™ student, you have the discretion to choose between a faster and a slower pace, and you are offered a great deal of flexibility in course scheduling and direction. With Premier Private™ instruction, one may be instructed alone, or in a group of up to three students – the choice is entirely yours. Study with your TOEFL® Instructor at one of our locations, at a local university or library, or at your workplace or home, for no additional charge. Above all – get dedicated, elite instruction, without the elite prices. And with our no-interest installment plans, it is now easier than ever to get the real help that you deserve. That’s just part of the Precision Learning difference. 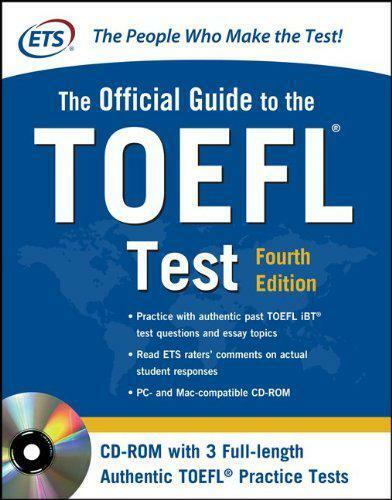 The following coursebook is included with your TOEFL® course tuition. The following are used for supplementary diverse training throughout your TOEFL® program. 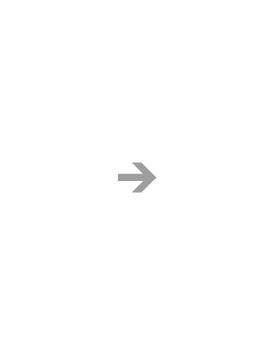 Pricing Table named "Course Comparison" does not exist. Personal Instructor. Personal Curriculum. You make the rules. Instructors from top schools. 97th-percentile scores. No exceptions. Come to us, or we’ll come to your library, home – wherever you choose. It doesn’t end at the door. You get an all-around immersion experience. We are not a test prep supermarket. Get real attention, from real experts. Save hundreds with Precision. Because education is expensive enough. We offer the most stellar Money-Back Guarantee around. Guaranteed. If your score doesn’t go up, retake sessions, on us, or get money back.